Victoria Colvin and Waterford are the Large Junior 15 & Under Hunter champions during the third week of the 2011 FTI Winter Equestrian Festival. Photo © Sportfot, Official Sport Photographer of the FTI Winter Equestrian Festival, www.sportfot.com. 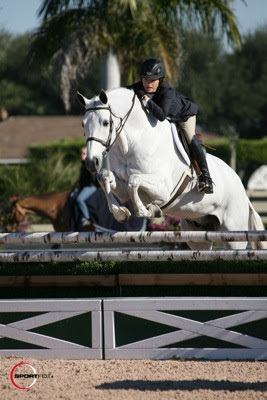 Wellington, FL - January 29, 2011 - The third weekend of the circuit was off to a busy start at the FTI Winter Equestrian Festival, which runs through April 3. The sun was finally out as the younger section of Large Junior Hunters stepped into the spotlight in the Rost Arena on Saturday morning. Victoria Colvin and Becky Gochman's Waterford were champions in this week's Large Junior 15 & Under Hunters. Waterford is a nine-year-old Hanoverian gelding by Don Frederico. Colvin, who only recently began showing Waterford, secured the tricolor by winning one class over fences, placing second in another class, placing third in two more classes, and seventh in the remaining class. Colvin stated that she loves riding Waterford because "he is sweet and very easy." She went on to say "He has a really fun jump because he has a big neck, so you can hold on to it!" The Large Junior 15 & Under Hunter division is arguably one of the toughest at the FTI Winter Equestrian Festival. While the kids competing in this division are still rather young, they are all business when they walk in the ring. Lillie Keenan, aboard the Chansonette Farm LLC entry Madison, took the reserve championship this weekend. Keenan won one class, placed second in one class, third in another, and fourth in two classes to win the reserve championship. While Colvin was more than happy to be awarded the victor, she had little time to celebrate before it was back to work aboard one of the numerous horses and ponies she will be showing this weekend. Colvin will continue showing her many mounts throughout the remaining weeks of the winter circuit. Tomorrow, the third week of the 2011 FTI Winter Equestrian Festival comes to a close, but not before the Children's Hunter 15-17 division is awarded their championship honors. Also, tonight will feature another one of the many classes in the "Saturday Night Lights" line-up. The $40,000 Surpass Grand Prix will begin tonight at 7 p.m. in the International Arena.